Once I decided that I would review Thermovex, I had to go about finding it. After searching TIRELESSLY online, I figured out that they only are availabel at Nutrishop retail stores. Frustrated, but not deterred, I got in my car and tracked down a jar of Evochem Thermovex at my local Nutrishop (luckily we have one in Santa Barbera!). Happy as could be that I finally had a fun new pre workout for women to try, I went straight to the gas station for a bottle of water, and then straight to the gym! I'll start with my initial thoughts on Thermovex flavoring. The flavor I got was Cherry Orange. Let me let that sink in for a minute. Cherry Orange! Literally I've never seen another supplement with this flavor before. Needless to say I was super excited to try it out. I took my water bottle, made a improv funnel out of one of my parking tickets, and dumped one and a half scoops of Thermovex into the liquid. I know most pre workouts say not to shake them, but I saw no such warning on this label- so I shook away. Thermovex frothed up a little, and mixed a really nice light orangish-pinkish, almost like a flamingo color. I liked it alot lol. Let's just say my first sip was legit. The thing you have to keep in mind is that I am not easy to please when it comes to taste. Like almost zero pre workout supplements for women, or any pre workouts, or, er- let's just say - almost NO supplements taste that good. They are all loaded up with sucralose and nasty artificial crap. I know they like have to do this to mask all the active ingredients, but I typically they either don't do that good of a job, or they overpower your taste buds. Evochem really shined here. Thermovex was not too sweet, but also not too 'thin' tasting that all the chemically tastes came through. The cherry orange was fruity enough, and tart enough to be believable, while still having the right hint of sweetness that made you want to drink it all day. I wish I could compare this Thermovex flavor to something else, but I literally don't know if I've ever had anything else cherry orange flavored. I really enjoyed the taste, and as you'll see, it is probably the most outstanding aspect of this pre workout. B-Vitamins: The first thing that stands out to me in Thermovex's formula is the amount of Vitamin-B. They cover off on literally every derivative of Vitamin-B known to man. These vitamins are critical to supporting the way your body regulates energy levels, which is my best guess as to why they focused so heavily on this micro-nutrient. 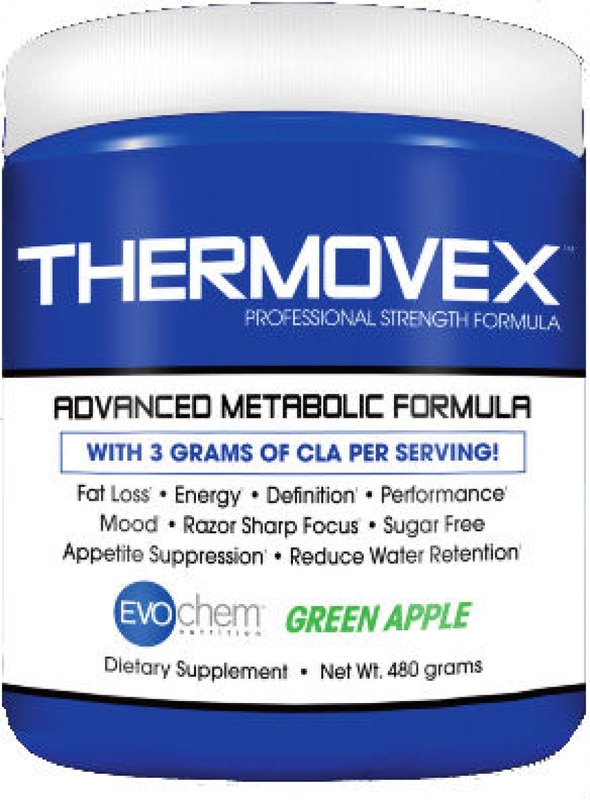 CLA: Conjugated Linoleic Acid, or 'C-L-A' for short, is the focus of Thermovex's formula. CLA is a fat found in red meats and dairy products, that has long been thought to possess lipid oxidation properties. 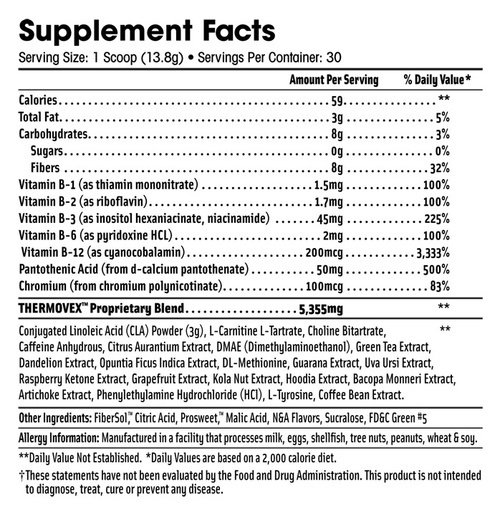 Since Thermovex is the fat-burning pre workout for women, it makes sense as to why they included it. How they got a fat to be a powder is beyond me, but they did put 3 entire grams of it in here. Now. The thing with CLA is that it has never been proven without a shadow of a doubt to actually provide these fat burning effects. Because of this, I have a really hard time giving this formula that much credit-especially given the way it performs (which you'll read more on later). LCLT: L-Carnitine L-Tartarate is a form of the amino acid L-Carnitne, which is supposed to be largely involved in fat oxidation, as well as improving athletic performance. LCLT is a trendy inclusion to this formula, and I have always been a fan of it. DMAE: Dimethylaminoethanol is a primary alcohol, believed to be a precursor to acetylcholine. DMAE is therefore a nootropic, or cognitive-support ingredient that has been used more and more in pre workout supplements over the last few years. It increases alertness and focus, while improving mood in a positive manner. There have been several tests involving DMAE over the years, but none are generally accepted as being conclusive. Citrus Aurantium: Citrus Aurantium is used to provide synephrine, which is an energy and fat-loss ingredient. It is an alkaloid that is present in low-concentrations in oranges and other plants and fruits. Raspberry Ketone: Raspberry Ketones are the substance in raspberries that give them their strong scent. After being thrust into the spotlight by Doctor Mehmet Oz, Raspberry Ketones have made their way into almost every fat-loss or diet product on the market. However, the studies are just not there to back the claims. It is mostly just for show. Green Tea: Unlike raspberry ketones, green tea extract is a proven sort of miracle ingredient. Assisting in everything from body composition to healthy cardiovasuclar function to cognitive support- green tea is a fabulous ingredient that serves many purposes to an athlete. Others: Among the other ingredients in Thermovex are Dandelion Extract, Opuntia Ficus Indica Extract, DL-Methionine, Guarana Extract, Uva Ursi Extract, Grapefruit Extract, Kola Nut Extract, Hoodia Extract, Bacopa Monneri Extract, Artichoke Extract, Phenylethylamin Hydrochloride, Tyrosine, and Coffee Bean Extract. This slew of ingredients is listed at the end of the proprietary blend, so I'm guessing that they are included in nominal quantities. Which is fine, because I have no idea what any of them are supposed to do lol. Ok so the flavor is great. The formula is decent. But how did Thermovex perform for me? Well unfortunately, not that well. After nursing my cherry orange flavored Thermovex (it really is that good), I hit the gym. As luck would have it, I was in time for my group cross-fit class. Well, it's called X-treme Burn, and it's our gym's watered down version of a cross-fit class. I thought it was the perfect test for Thermovex pre workout. It's not the hardest workout I've ever done, but it's up-tempo, and gets the blood moving. My first circuit was (unfortunately) burpees paired with dumbell split squats. I retract my previous statement about it being watered down- nothing about burpees is watered down. To be honest, I'm not sure that I felt Thermovex kick in that much during the early going of my workout. Maybe a little boost of energy from the synephrine and the B-vitamins, but that was it. The next portion of the circuit was bodyweight squats paired with a dumbbell shoulder circuit. Thermovex actually started to push me through this and the middle part of my workout. I'm not totally sure why or how, since it isn't really a stim-based formula, but I really did feel Thermovex provide a some pop about 20 minutes in. Now. The second half of the workout was a bit of a struggle, and I think I know why. The workout intensity stayed up-beat and I was getting really tired. A good tired, but I was starting to feel it for sure. Then all of a sudden I started feeling a little queasy. And then a little queasy turned into o my gosh I really need to go to the bathroom. And that turned into, well, let's just say I retired early from the workout. TMI? Ya. But I've got to tell it like it is, so that you don't end up in the middle of YOUR workout, having to sprint to the lockers like I did! This is by far the worst part of this product- it's that ALL that FIBER is great for supressing your appetite and all, but it's fiber. Fiber makes you go potty. And that's why it's not a standard pre workout ingredient. It's actually one of the last things you want right before a workout. Because Thermovex basically ruined the last part of my workout- I had to hit it with an average score of 7.5. Thermovex is a relatively harmless formula in the sense that nothing in here is going to cause serious side effects. That being said, there are a few things to keep in mind if you're considering Thermovex as your next pre workout. Too Much Fiber: Looking at the supplement facts panel, you can see that there are 8 whole grams of fiber in here. Now, that shouldn't be an issue, but as you just read, it DOES come into play if you are using it as a pre workout, like I did. When you consume that much fiber at once, and then jack up your metabolism with a high intensity workout, you might get some 'digestive discomfort' to put it mildly. Synephrine & NCAA Compliance: I've written about this topic in some of my other pre workout reviews, but I always make sure to include it each time, since I did have a friend who almost lost a year of eligibility because of a supplement with Bitter Orange in it. Synephrine is not an approved substance by NCAA, so if you're a college athlete- take Thermovex at your own risk. Thermovex packaging is ok. I really don't have that much to say about it because it's just so plain. I get that it's not specifically made for women, so from that standpoint I get that it doesn't look like the 'Hello Kitty' pre workout. (some of them really do look like 'Hello Kitty' pre workout, am I right?!). The jar is just so boring with the blue on blue on blue label, with the white lid. The typefaces are all boring, and, well, just nothing jumps out at me as being good about this packaging. Discaimer: If you've read my reviews before, you know I'm a tough customer when it comes to packaging- but this is pretty lame. The other thing I've got to unload in this review is the name: Thermovex. Thermovex. Thermovex? I mean, what is this supposed to be? A Star Wars Ship? A superhero film villain? I just don't get what would possess you (Evochem naming-guy), to call your pre workout Thermovex. It's a horrid name let's be honest. You get a 'D' on packaging mostly because the name stinks.